I have been CASeing SO much lately, that I am uber proud of today's card! I enjoy the CAS blog very much! Even tho the layout is theirs, the card is all me! I love that about their blog, it is a starting place. From there you choose the stamps, card stock, ink and embellishments! Dimensionals, Rose Red Seam Binding, $1 bin stamp for greeting, blender pen, retired DSP, Stickles for the flowers (hard to see here). I usually go for quick and easy, but I wanted to try water coloring with the blender pen! I need to get more so I have one for each color family; blues, greens, yellows, reds. It took WAY longer than markers, but I like the softer look I got with the blender pen, and it was kinda fun to do something different! My new job is going great, but hasn't left me for much stamping time---(insert sad face)....but there is CUB this weekend! Yay! This copy is a total CASe! Not gonna lie. It was to perfect to change! HERE is where I copied from! black satin ribbon, small oval punch (SU), Dimensional, Framed Tulips embossing folder, SU markers. When was the last time you mailed someone a hug? I bet it's been to long! Remember, a handmade card is a hug with a fold in the middle! Kathie says so! Some day I need to get a photo tent to take better photos! The yellow in these photos is so off. It is the exact same color IRL, but looks so funky here! I started by using the 1 1/4 inch circle on the card front to create a window. I then grabbed the turquoise cs and punched a 1 1/4 inch circle, then used the 1 3/4 to create a larger circle around that to frame in the hole on the card front. I stamped thank you onto white cs, punched out with the 1 1/4. So a wonderfully talented stamper sent me this today! She also just happens to be my daughter, and the mommy to the Gran Baby! She, like most of us, struggles with small images and how to use them. Well, I think you're on to something here! Thanks for the love girlie! I hope the rest of you are inspired! Sometimes I am the most uncreative stamper there is. I am one heck of a copier though! HERE is the link on SCS to the card I almost perfectly copied! I wanted to spruce it up a little with some striped ribbon, but the rest is straight up her design! Punches used: 1 3/4 circle, Decorative Label, Pinking Hearts Border (inside). CS used: Chocolate Chip, Pretty in Pink, white. I used SU Markers to color the jammie's. Then I popped up the image with Dimensionals. Here is the same version in Bashful Blue! There is a layer of CS on the front, and I thought about giving it some texture with the Cuttlebug, but decided against it. Now I wish I had or else popped it up with Dimensionals too. I think it needs a little something to make the layer more obvious. I had a hard time deciding whether or not to make this little cutie at stamp club next week, but since I have decided on something else, I can show you this now! 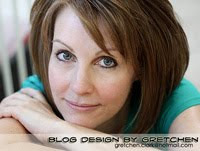 I cruise her site and subscribe to her bi-monthly newsletter and she is fabulous! One sheet of CS will make two of these little boxes....I love smart card-stock-usage. It makes me happy....odd but true! If you want the directions they are only available until the 13th of March through her newsletter, so get it before its gone! I was out sick for two days this week, so I made these for my co-workers who had to cover for me! I am starting a new job Tuesday and I will dearly miss my time with my current co-workers. We have had some darn good times together! Laughter is a part of our everyday, at least at some point. I know they will be glad when I come to visit, so long as I bring treats! I am lovin' the brown and blue combo! It is so perfect for this set! HERE is my inspiration. I WAS going to try the scrunched ribbon technique, but alas, I forgot. By then the image was placed and there was no room. Oh well, next time! I love the detail that SU's half back pearls add, so right for butterflies. Here we have Early Espresso and Bashful Blue ink and CS. I also used the SU Sizzix folder, Framed Tulips. I guess I took the photo crooked! I bet my friend Gretchen_Clark could help me fix it.......maybe next time! I just got the new Bliss set from the SU SAB catalog, and it is fantastic! SCS is full of wonderful inspiration for this terrific set, and I CASed this one for sure! Just a few minor changes and I am happy! HERE is the blog I snagged this beauty from! I used Tangerine Tango, Daffodil delight and Pumpkin Pie inks. Bliss and So Happy for You SS. The rhinestones are from my LCS. I used the 1 1/2 inch Marvy circle punch and Dimensionals to pop the butterflies up! Lastly the Sizzix embossing folder is by SU called Elegant Lines. I have a few more projects this week for you using the Bliss set. Sometimes it is fun to concentrate on just one set for a while! Stamp club girls-----check your emails this weekend for your "Who's When and What's What" email! Well here he is, the star of the show~! His first birthday was so fun! His mommy and daddy gave him the cutest party, and the theme was puppies! He loves puppies! His daddy wanted him to have this firetruck ball pit.....and after mommy got inside with him, he loved it! Time flies so fast.....it seems like we just brought him home and now he is scraping frosting off his birthday cupcake and loving it! This boy loves being outside and at the park, so it was special to be able to take him there twice during his birthday weekend! Thanks for taking a peek into my life, stamping stuff coming soon! Time flies faster with grandchildren. If you have some then you know I am right! Especially if they don't live near you. My little guy lives 400 miles away, and while I am thankful it is not more, it is still 400 MILES! I wanted his card to be special like him! His parents did a jungle theme in the nursery so I went with the cute little monkey! I hopped on SCS and looked at all the monkey punch art there was and picked out my favorite elements from a couple different ones. I used these punches; 2 inch (blue) Marvy, SU extra large oval, SU large heart, 1 1/4 inch circle, 1 inch circle, 1/2 inch circle and 1/4 inch circle. I drew the smile and nose holes in myself. The hat is free hand from Celebrations DSP. I used Pacific Point and Bashful CS, along with some Poppy ribbon from PTI! The dry embossing is a Cuttlebug folder that is one of the first couple I bought, and I am pretty sure it is still available at your LCS. Cute right? For the inside I used a strip of Celebrations DSP and some fun alphabet stamps. These are from Tidy Alphabet which is retired (sorry)! The ink colors match the DSP, Wild Wasabi, Pacific Point, and Real Red. Today is his little party, and all the grammas, grampas, and great grammas and grampas will be there! It will be so fun to be there and watch him enjoy his first birthday. I am so blessed! Next post will be non stamping related so I can share a photo (or two) of the birthday boy! I am off to visit the granbaby and celebrate his first birthday! Where has the time gone! Crazy! I will post a pic of his first birthday card on Saturday so stop back then to take a peek at some punch fun! I plan to post a pic of the little monkey blowing out the candles or eating cake with his hands or some other cute thing after the party too~!! Happy Friday, stamp something. And if your "you know who", you owe me a card......get on it! Today I combined last years Sale-A-Bration set for the greeting, with one from this year called Sweet Summer! I wish the colors were better in the photo. Its a really pretty card! I CASed it from HERE. I changed a few things as you can see, but I fell in love with most of the rest of the card! I used So Saffron, Marina Mist, Certainly Celery and white CS. I used SU' markers in the same colors to fill in the flowers. I added the little grommet from my stash. I popped the main image up with Dimensionals and the rest is plain to see! ~~I accepted a new job Monday! I start as a teller on March 15. I am excited about this new opportunity! However, the pre-job paperwork, fingerprinting, background check, and training will likely seriously dent my stamping time. Please be patient with me as I may be irregular here (again) for a while! Who can you encourage with a handmade hug in the mail today? Just do it!